528 Records generates “medicinal music” by your generous donation(s), remastering previous “stressful” recordings made in “standard tuning” of A=440Hz to A=444Hz, nearly 2/3 of a half-tone higher, to sync with C=528–the “LOVE frequency” resonating at the heart of everything, universally. Take for example, the heart of the rainbow vibrating yellow-green at 528nm, or the sound of the sun waffling around 528Hz frequency, courtesy of recordings made by NASA. 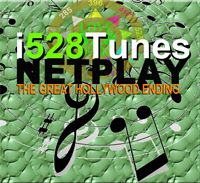 528Records.com makes the greatest contribution we can make to people’s health, and world peace, by transposing and broadcasting in the “key of LOVE,” that you too can enjoy by simply listening to the 528 Radio Network’s “medicinal music” stations. 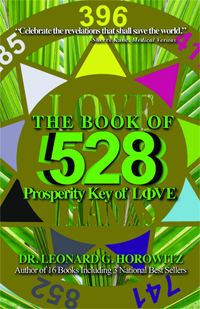 The research and science evidencing this wonderful mission and service is beautifully detailed in Dr. Leonard Horowitz’s Book of 528: Prosperity Key of LOVE. Love is the “Universal Healer,” and the frequency of this energy is widely regarded as “miraculously healing.” This is “therapeutic frequency” music that is relaxing as opposed to distressing. 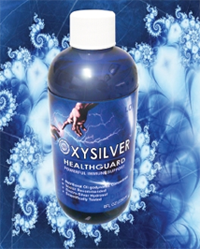 528Hz broadcasts are even, theoretically, miraculously curative by its positive impact on DNA structure and rejuvenation. This is because that frequency–528Hz sound and 528nm light–is central to universal construction, and reconstruction, including reconstructing yourself, your DNA and more, vibrationally. This can be most easily affected by contributing your music and donations to 528Records and listening to 528Radio.com stations that broadcast music recorded in, or transposed to, exclusively 528Hz. Recording artists are encouraged to sign up to receive their 60% royalty on any downloads generated by donations listeners/users make for their works. 528Records.com freely transposes the original tracks into 528Hz, and this “remastering” naturally can be used by the artist(s) as they wish, since it is their copyrightable work. Artists can regenerate their albums, track by track, transposed in the LOVE/528 frequency, so that music becomes more than entertaining or enjoyable, but optimally uplifting and healing. 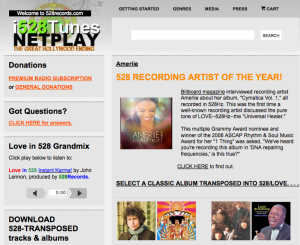 528Radio.com plays music transposed using the 528Records.com service. This 528 music exclusively plays 24/7/365, broadcasting only the “good vibrations” of LOVE that re-tune your heart, mind, body, and spirit to the frequency of LOVE/528 that is central to creation, restoration, and nature’s sustenance. Stop listening to distressing music in whatever genre. Open 528Records.com, use the service, and select from a wide variety of genres, artists, and tracks. Your contributions of money and music build the “528 public library” of transposed works, and generate the playlists broadcast over the 528 Radio Network. You can select from many genres of music to enjoy from sunrise to sunset, for active work, exercise or play, for bedtime relaxation or simple enjoyment. Also, playing 528Radio is like throwing a pebble into a pond. The waves ripple out from your speakers to touch the hearts of others, theoretically everywhere (transmitted by the hydrated atmosphere), to help awaken the “consciousness” of people globally to co-create a better, healthier, safer, and more loving world. CLICK HERE to DONATE NOW to grow this wonderful service.